Essentially, Asghar Farhadi is a master of domestic drama, yet the intensity of his films is almost paradoxical. The answer lies in his Persian homeland. The troubled couples populating his films must not only deal with problems New Yorkers can relate to: money is tight, affordable apartments are scarce—but they must also withstand outside social pressures peculiar to Iran, particularly with regard to gender roles and class inequities. Although not expressly or intentionally political, Farhadi’s films always hold up a mirror to Iranian society and the Iranian national character. Emad and Rana are the latest Farhadian couple, whose union will be tested by a brief but damaging home invasion in Farhadi’s The Salesman (trailer here), which opens this Friday in New York. The sky almost literally falls in on Emad and Rana in the opening sequence. Forced to evacuate their flat in a building in imminent risk of collapse, the literary couple thinks they have caught a break when a fellow cast-member in their amateur theatrical production of Death of a Salesman offers to rent them one of his units. However, they quickly learn from gossipy neighbors the previous tenant was a woman who had many gentleman callers. Everyone clearly understands this is code for a prostitute, but it is still vague enough to nag at Western viewers. Although nobody in the building suggests the young couple is anything like the prior tenant, the lingering talk still unnerves them—with good reason. Tragically, when Rana is violently accosted by a former customer of the previous tenant, she finds herself assuming a defensive posture. Withdrawing into herself, she leaves Emad feeling hurt, neglected, and hungry for vengeance. Much to his surprise, Emad might have an opportunity for the latter. You might not think Arthur Miller’s Pulitzer Prize winner is particularly risqué, but you probably never tried to stage it in Iran. We know from incidental conversations, the censors demanded many cuts before allowing the stage revival to go on, but that is a marginal concern (at best) to Farhadi. The choice of Death of a Salesman was not random, but Farhadi resists slavish one-to-one parallels. What is important is the naturalism shared by film and play as well as the sense of impotent futility plaguing Emad and Loman. Shahab Hosseini’s Emad is a classic Farhadian protagonist. He likes to project an image of cosmopolitan hipness, but when his illusion of security is violated, he lashes out in a desperate attempt to reassert control. It is a smoldering, visceral turn, comparable to Peyman Moaadi’s international breakout performance in A Separation. For a long stretch, Taraneh Alidoosti’s Rana comes across problematically passive, but she cuts viewers legs out from under them in the third act, revealing just how much better she understands the complex situation than the indignant Emad. Yet, the real arsenic is delivered by Babak Karimi as the unprepossessing mystery man. Success clearly agrees with Farhadi, because his Oscar win for A Separation has not abated a remarkably fertile creative period for him, dating back to at least Fireworks Wednesday in 2006, but most likely earlier. He masterly cranks up the suspense in the third act, through “traditional” means and distinctly Iranian sources alike. It is another masterwork from one of the most important filmmakers currently working at the height of their powers (we’re definitely talking top three here). 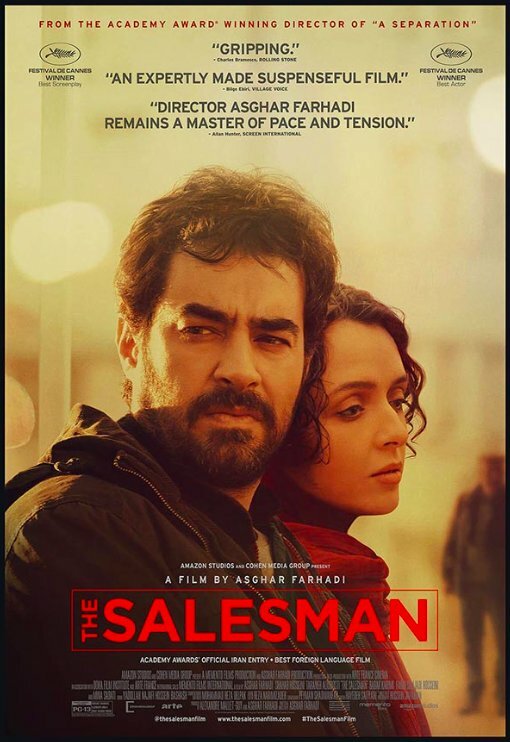 Very highly recommended, The Salesman opens this Friday (1/27) in New York, at the Angelika Film Center downtown and the Lincoln Plaza uptown.